Marketing concept is a business strategy whereby consumer demand is the guiding principal for all of the company’s decisions. This is especially important in the decision-making process of new products. With the marketing concept, the business takes the consumer preferences and needs as its starting point for developing a new product. In contrast to other business strategies (explained later), this approach does not focus on the capacity of the business nor its production costs. A business that adopts the marketing concept as its main strategy does so with the belief that this approach will maximize sales and profits. The marketing concept is a response to the changing market conditions. Disposable income increased but so did the volume of products. Producers were faced with more intense competition and consumers that became more picky. The combination of these two changes made it more difficult for businesses to achieve sales and profits. Producers were then pushed to seek a different approach. Essentially, consumer demand became more influential. Successful businesses changed their approach to become more in tune with the preferences of consumers. By developing products that were designed based on consumer preferences, the successful businesses were able to differentiate themselves from their competitors. The marketing concept gave these businesses competitive advantage. Competitive advantage is when one business has an edge on other businesses. Consider the following example of a company that has adopted the marketing concept. Take Company Z, a clothing company. Company Z does extensive market research every season. Every season’s collection is designed and produced following the consumer feedback from the market research. Though the marketing concept is a widely adopted business strategy today, it is one of the newer business strategies. Aside from the marketing concept there are four other concepts. 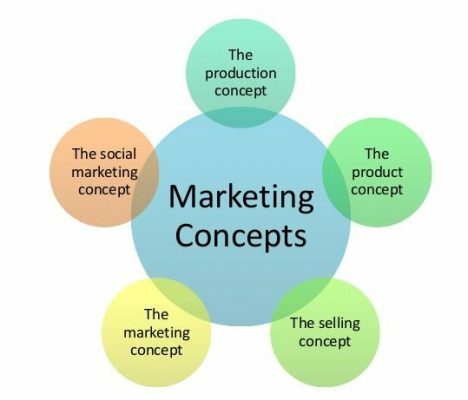 These are the production concept, product concept, sales concept and societal marketing concept. Under the production concept businesses focus on producing large volumes of cheap products. This strategy assumes that consumers only want to pay the lowest possible price. The downfall of this concept is that to stay profitable, the business may have to lower the quality of the product. Taking the fictional example of Company Z, adopting the production concept would mean that the clothes that are produced only use the most widely available fabrics. This lowers production costs which allows for lower selling prices. Company Z would also maximize its volume to increase profits. In contrast to the production concept, the product concept focuses on delivering the best possible quality products. These businesses focus on the functionality of the product and the quality materials used. Unfortunately, a product of the best possible quality does not necessarily translate to sales. With the product concept, Company Z would not focus on market research or cutting production costs. Instead, Company Z would spend more time on developing top quality clothing and be more experimental with the functionality of the clothes. The sales concept is one of the more aggressive strategies of achieving sales and profits. With this strategy, it does not matter whether there is already a consumer demand for the product nor how the product is produced. Businesses using this marketing strategy operate with hard selling and forcing demand. Using the sales concept, Company Z creates demand for its clothing through a prominent promotional campaign. The quality of clothing and current consumer taste in clothing is irrelevant. The societal marketing concept is a modern day evolution of the marketing concept. Under this business strategy, companies still use consumer demand as their starting point but also consider the social welfare effects of the product and production process. The business not only develops products and services that meet consumer demand but ensure there are no negative repercussions for society or the environment. Being more conscious, Company Z would have to invest in producing environmentally clothing that still meets the styles and materials desired by their consumers. Company Z will have to find a sweet spot whereby their production process still allows for the clothing to be sold at an attractive price point. Marketing concept is a business term that is often confused with other terms. The terms marketing and marketing concept sound similar which is why these terms are sometimes used interchangeably. However, each of these terms refers to a different idea. Marketing is an aspect of business whereby activities are performed to boost branding and sales. Activities include market research, developing promotional campaigns and building relationships with other brands for marketing partnerships. In contrast to the marketing concept, marketing only refers to a specific area of the business process. Marketing is usually a department within the business while the marketing concept is the driving philosophy for the entire business. 1. What is the difference in the approach towards product development between the marketing concept and product concept? A. The marketing concept takes consumer demand as its starting point for product development while the product concept takes the product itself as the starting point. B. The volume of products produced will be greater from a business that uses the product concept approach compared to a marketing concept approach. C. The product development process is longer with a marketing concept approach because more time is needed for market research. 2. Which of the following statements is most suitable for a business operating under the marketing concept? A. Our goal is to develop a product that consumers are willing to pay more for because of its zero waste production process. B. Our goal is to develop a product without producing any waste, no matter the cost. C. Our goal is to develop a product that meets the environmental impact standards of our consumers. 3. A recent national study has shown two significant trends. An artisan chocolate company that is a strong believer of the marketing concept has read the study. Which of these trends is most likely to influence the make-up company’s strategy? A. Consumers are more environmentally conscious and prefer environmentally friendly products. B. Consumers are spending less on foodstuffs.